beauty: Best in BALM – Girl Who Would be KING on Life, Style and INSPIRATION. SUPER SEVEN! Exotic, Organic beauty. Paraben + Cruelty Free. It’s called Divine Balm by SkinsoDivine. Why? Because it’s a special 3 in 1 *balm which contains seven superstar ingredients rich in moisture and vitamins to help smooth and soften the skin on your eyes, lips and cuticles. A divine selection even if I say so myself. Why should I say so myself? Hmmm…seems like forever that I’ve been trying to formulate what I believe to be the most effective of all balms. The balm of balms. I’ve tried out so many different concoctions to get it right. And of course at first I had to get some extremely picky friends (but then again most of my friends are unbelievably picky) to try it out and give me their totally honest feedback. I’m very happy with the results. There are three other products in the line all made with 100% nourishing natural oils for all skin types, even those who suffer from rosacea. Having said that, I will be the first to admit that anyone can have an allergic reaction to any single ingredient so it’s best to read what is in each product first. I have sensitive skin and it works for me. 1) Soybean Oil – one of the major benefits of soy oil is that it’s a very good oil for protecting skin from UV rays. Soy oil helps to cure skin damage and gives it a healthy glow. It is a rich source of linoleic acid, which is a type of omega-6 fatty acid. It contains B vitamins along with Vitamin E and Vitamin K. In addition the Vitamin E in soybean oil keeps the skin smooth and healthy. 2) Jojoba Oil (native to southern Arizona, southern California, and northwestern Mexico) – One big bonus is that it contains almost all of the vitamins and minerals essential for healthy skin: vitamin E, B-complex, copper, zinc, selenium, iodine, and chromium. And it’s even gentle enough to be used on sensitive skin without causing allergic reactions. 3) Rosehip Seed Oil (Chile) – is high in linoleic acids, vitamin C and Vitamin A (retinol). It will help to regenerate tissue and eliminate wrinkles, fine lines & sun damage. It actually deserves a whole post of its own (coming up I promise). A little gossip…it wasn’t until former Victoria’s Secret Angel Miranda Kerr name dropped it as the secret to her radiant complexion that we decided to further explore this oil. 4) Carrot Seed Oil (obtained from wild carrots which are usually found in Europe) – is high in antioxidants and will help protect your skin from environmental assaults like UV rays & pollution. It has an amazing ability to rejuvenate the skin and stimulate cell growth and repair damaged skin. While it can’t turn back time, it can help you look younger and more radiant. 5) Kukui Nut Oil (Hawaii) – is fortified with essential fatty acids, Vitamins A, C, E and antioxidants. Also rich in Linoleic acid – an omega fatty acid that your skin will devour. Kukui nut oil also works well as an under eye treatment for the prevention and softening of crow’s feet. 6) Sea buckthorn Oil (Tibet) – is loaded with antioxidants, including vitamins C and E, and studies show that these two nutrient powerhouses can prevent wrinkles. Of the essential omega fatty acids found in Sea Buckthorn, one of the main moisturizing essential fatty acids is Omega 7 palmitoleic acid. Palmitoleic Acid (Omega-7) is a natural component of skin. It is considered a valuable topical agent in treating burns and healing wounds. 7) Shea Butter (Africa) – is very rich in fatty acids as well as Vitamins A and E. Applied on the skin, it intensely hydrates and soothes the skin as well as helping to restore the natural skin barrier. Good to prevent black under eye circles. *A balm has a different consistency than a cream or lotion, it’s more of a thicker ointment that glides on easily and sinks right in. 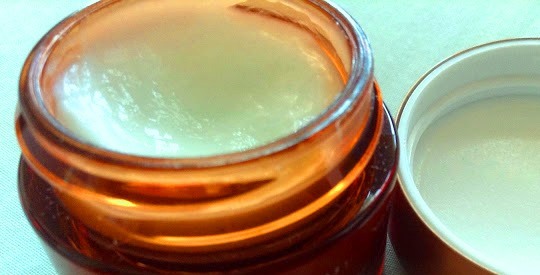 Do you use an eye or lip balm? If so, what do you recommend? great post – very enjoyable and informative! Thank you, I’m so happy you enjoyed it. Previous Previous post: style – chic speak!